After all of my fancy eating in NY a couple weeks ago, I was in the mood for...more fancy stuff. Yeah, moderation? What is that? I stopped short of suggesting to Mr Minx that we go out for dinner on Sunday because, honestly, I had already spent enough money on food for the week, plus I was feeling a teensy bit guilty for dining out without my hubby at my side. So I attempted to make up for it by creating a restaurant-quality dinner at home. That started out with a quick rummage through the freezer. There I re-discovered a package of Chinese sausage that I knew was in there but hadn't seen recently, and a ton of fish recently procured on a trip to Trader Joe's. Given the choice between salmon, mahi mahi, and swordfish, Mr Minx chose the latter. I decided to make a dish with Asian flavors (naturally - my usual M.O.) 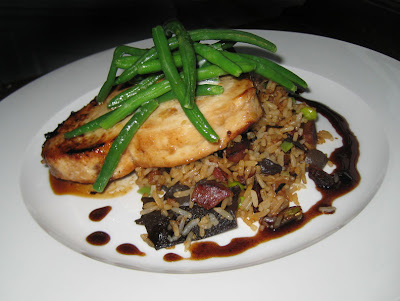 - fried rice, marinated swordfish, and some simply-buttered green beans. After more consideration, I thought a sauce might be nice and did a riff on the black pepper gastrique I had at The Modern the day before. The fish was meaty and buttery, the rice had lots of interesting textures from the snappy mushrooms and the sausage bits, and the sauce added much-needed acid tartness. The sauce was rather rich and while it was fine with the meaty fish, it would probably work even better with red meat. Place first five ingredients in a non-reactive container. Add fish. Marinate for at least 15 minutes and up to 1 hour. When ready to cook, remove fish from marinade and pat dry. Preheat oven to 400F. Heat an oven-proof skillet over high heat and add a drizzle of canola oil. Add swordfish and cook about 2-3 minutes, until bottoms are browned. Turn fish and place in preheated oven. Bake 8-9 minutes, until cooked through. In a large saute pan, heat canola oil over medium-high heat and add onions. Cook until wilted, 3-4 minutes. Stir in sausage; cook until onions brown and sausage begins to get crisp, about 8 minutes. Stir in garlic and cook an additional minute. Add rice, breaking up any clumps with a wooden spoon. Stir in mushrooms, five spice powder and soy sauce. Continue to cook, stirring occasionally, until rice is no longer white and is beginning to crisp up a bit, about 6 minutes. Stir in edamame and scallions and cook until vegetables are warmed through. Place sugar in medium saucepan and heat over medium heat until sugar begins to melt. Stir until sugar dissolves, then cook without stirring until deep golden, about 5 minutes. Pour in vinegar, which will cause sugar to harden. Continue stirring until sugar remelts. Add tamarind concentrate and water and turn heat to high, stirring constantly to dissolve tamarind. Bring to a boil and when liquid begins to thicken, add broth. Continue boiling until gastrique is thick enough to coat a spoon and is reduced to about half a cup. Stir in pepper. Place a mound of rice on a plate. Top with swordfish steak. Drizzle with gastrique. Top with cooked and lightly buttered green beans, asparagus spears, or a handful of arugula or watercress dressed with a squeeze of lemon juice.